So it would appear when the Democratic gubernatorial nominee's words are twisted by the Republican's campaign, which was pitching the campaign's spin du jour. The appeal was believable. McAuliffe cultivated a mighty cozy relationship with Big Labor as Democratic National Committee chairman and chief rainmaker for Bill and Hillary Clinton. Organized labor has already contributed $723,000 to his campaign, according to the independent, nonprofit tracker of cash in state politics, the Virginia Public Access Project. On Tuesday, McAuliffe himself opened the door to it with incomplete, evasive responses to reporters about the prospect of union favoritism in Virginia if he's elected. But Cuccinelli's campaign and its Republican cohorts shoved McAuliffe's comments a big step farther than he actually took them. In the first place, McAuliffe couldn't repeal Virginia's ban on compulsory union membership as a condition for employment if he wanted to. It was enacted by Democrats at the dawn of the Cold War, and legislatures and governors of both parties have jealously reaffirmed ever since. "We are a right-to-work state that has been here for many years, and it's not going to change,'' he said when asked about it during a media availability at a northern Virginia transit rail station soon to go online as part of the Washington Metro system's expanded service. By Thursday morning, McAuliffe had gotten about as definitive he gets in addressing the issue. 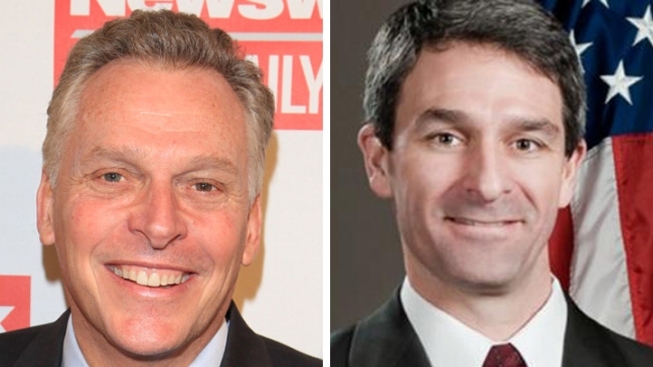 "Right to work has been the law here in Virginia for 65 years, and I wouldn't change it,'' McAuliffe said after a forum in which he and Cuccinelli separately fielded questions from leaders of northern Virginia's influential technology business sector. McAuliffe's team and his Democratic allies are no less guilty of exaggerating and bending the words and actions of Cuccinelli and his Republican ticket mates. Cuccinelli has a long, vivid record of activism in support of abortion restrictions, both as a state senator and as attorney general, and he doesn't deny it. He strong-armed the State Board of Health when it recommended regulations exempting existing stand-alone abortion clinics in 2012 from a new state law that holds abortion providers to the same stringent architectural and safety requirements as hospitals. After threatening to withhold legal representation of board members by the attorney general's office from lawsuits over their proposed regulations, the board reversed itself. The new regulations took effect last week. His cohorts on the GOP statewide ticket also have a substantial history of supporting curbs on abortion. Attorney General candidate Mark Obenshain sponsored a bill in the state Senate that would have compelled women who suffer miscarriages outside the presence of medical care to report it to law enforcement. And E.W. Jackson, the fiery conservative pastor of a predominantly black church in Chesapeake, once said that Planned Parenthood had been more lethal to black lives than the Ku Klux Klan. Yet none of the Republican candidates has publicly proposed total abolition of abortion or policing contraceptives, much less placing it atop their to-do lists. McAuliffe's overreach earned him a flat-out ``false'' on the Truth-O-Meter of PolitiFact Virginia, a partnership of the Richmond Times-Dispatch and PolitiFact.com. Cuccinelli's press aide, 27-year-old Anna Nix, is a bright apprentice learning the increasingly savage profession of politics in Virginia this year, and she was only doing her job in pitching the story Wednesday. It's no different for her Democratic counterparts. But why inflate the menial when there's far more meaty material to mine. Cuccinelli is dogged by questions about why the chief executive of a troubled tobacco and nutritional supplements manufacturer would ply him with nearly $19,000 in gifts, including a $3,500 lake lodge summer getaway and a $1,500 catered Thanksgiving dinner for his family. McAuliffe is beset by the failure of electric-car and wood-pellet fuel manufacturing ventures he led to approach the expansive job-creation guarantees he made. The car venture, GreenTech Automotive, opened in a Mississippi suburb of Memphis, Tenn., after McAuliffe claimed Virginia had no interest in it, but state email records show that Virginia economic development officials under Democratic and Republican administrations continued working with the company despite deep misgivings. Each of these flawed candidates hopes to divert attention from his own failures by pointing loudly and continuously to those of the other, real and imagined. The truth lies more in what both campaigns won't tell voters than in what they will spend millions of dollars in the next five months trying to make them believe.